With a history dating right back to 3,000 BC, Oman’s unspoilt Land could tell us a thousand tales. It was the birthplace of queen of sheba, the last resting place of prophet job and the home and port of the famous adventurer, Sindbad the sailor. So it is no wonder that the sultanate Of Oman has such an abundance of hidden treasures. From the Grand Forts, Exquisite Palaces and Mystical Souq’s of the Capital Muscat, to the Undulating Dunes, Fresh Water Wadis and miles upon miles of Unspoilt Sandy Beaches, Oman is just waiting to be discovered. Discover the hidden treasures of Oman with Ahlan Arabia Tours LLC, Oman’s leading destination and Leisure Management Company. 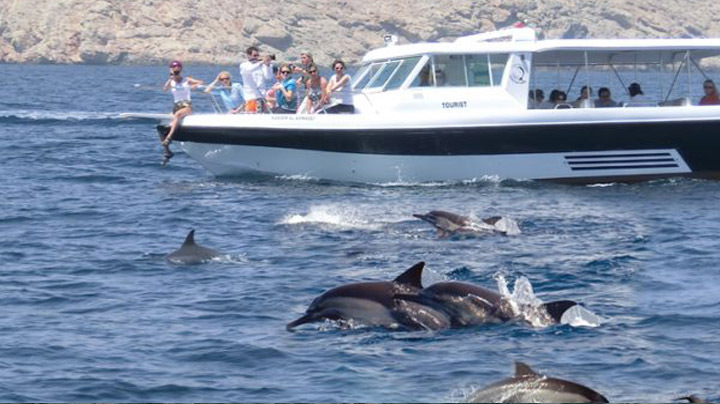 We cover everything from desert safaris and twilight cruises, to exploring the Dolphins and deep-sea fishing. What is remarkable is that our Tour guides will enjoy the trip as much as you will. Even after having done the tours numerous times they still enjoy meeting new guests. They delight in explaining Omani Culture and History. So if you want to discover the ‘real Oman’, take a look through this booklet and find out more about our full program of tours and excursions. The Tour begins by driving through beautiful diplomatic City of Muscat to visit Sultan Qaboos Grand Mosque, a splendour of unique Islamic architecture. The Tour continues to step in to the traditional Muttrah Souk which is well known for its silver craft shops, perfumes and souvenir and we drive along the waterfront Corniche to Fish Market. Our next stop is at Bait-Al-Zubair Museum with its wealth of information and exhibits on the country’s culture, tradition and heritage. Tour continues to old Muscat for photo stop at his Majesty Sultan Qaboos official Palace-Al Alam and 16th Century Portuguese fort Al Mirani And Al Jalali. The Tour is 4WD car up to 4 passengers. Nizwa, capital of interior, is the birthplace of Islam in the sultanate of Oman. Nizwa boast of the famous Round Tower Fort, built in the 17th century, and its Souq renowned for its Friday cattle auction, intricately hand-curved “khanjars”(daggers) and ornamental silver jewellery. Your Tour continues to Al Hamra, one of the last loan villages in Oman and you head up to Jebel Shams, ‘Sun Mountain’-Oman’s highest peak nearly 3000 meters. At the upper reaches of the mountain is the ‘Grand Canyon’, which gives breath taking views down to its floor. Feel the cooler climate on the top of the Canyon. Nizwa, capital of interior, is the birthplace of Islam in the sultanate of Oman. Nizwa boast of the famous Round Tower Fort, built in the 17th century, and its Souq renowned for its Friday cattle auction, intricately hand-curved “khanjars”(daggers) and ornamental silver jewellery. Your journey continues on a scenic mountain route up to the roof Oman and feel the climate cool down on top of green Mountain. Jebel Akhdar offers discovery ,adventure and a fascinating insight in to the life of one of the most in accessible places in Sultanate Of Oman. we take a leisurely walk through the hanging gardens which runs along the side of original Falaj system and visit Diana Point with spectacular Views out across the Canyons And Terraced villages of Jebel. A full day tour along the Batinah coast. Our first stop is the Seeb Fish Market by the seaside. Drive through the date palms to the sparkling springs and at Nakhal. Visit the beautiful Wakan Village famous for its terrace farming. Our next stop is Wadi Abhyad which has large patches of white sedimentation and when translated means White Wadi. The drive wind through the mountains with small pools water dotting the Wadi bed. The highlight of this trip is visit to the latest attraction in the Nizwa region, the Al Hoota Caves. Depart Muscat to Nizwa. Visit first the famous Round Tower Fort, built in the 17th century, and the Souq renowned for its Friday cattle auction, intricately hand-carved “khanjars”(daggers) & ornamental silver jewellery. Proceed to the Al Hoota Caves where one gets a chance to view stalactites and stalagmites as well as an underground lake home to a rare species of blind fish. The show-cave can only be reached by visitors in an electrical train that runs through a tunnel alongside the main entrance. The show-cave is equipped with pathways and special lighting system. Guided tours provide explanation and are customized according to visitor’s expectations. On the way back to Muscat visit the pretty village of Birkat Al Mauz situated at the foothills of Jebel Akhdar (Green Mountains). Enjoy a walk through its oasis and dense date plantations. Your tour begins with mountains passing through the Sumail gap. Journey continues to the Wahaiba Sands, a romantic desert with rolling sand and dunes. This is a traditional home of the Bedouin who knows how to survive in these harsh desert conditions. 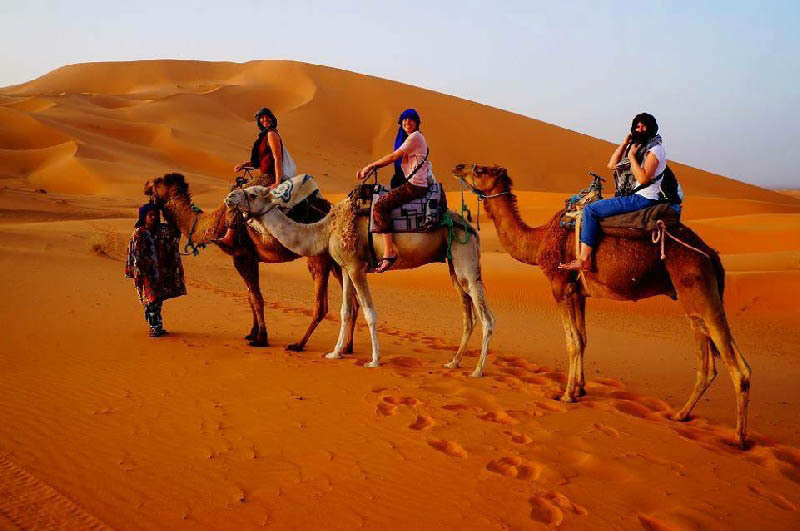 Experience an exciting dune drive and you are invited to meet a Bedouin family. There is an option to arrange camel ride if required. Your journey continues to Wadi Bani Khalid. Enjoy a gentle walk along the river bed and cool down in the crystal clear waters of the rock pools of Oman’s one of the largest and most picturesque Wadis. This is one of the classic tours best to avoid it at weekends or on holidays as it can get crowded From Muscat.we drive towards Quriyat and then along the coast towards Sur.Our first stop is at the Bimmah sinkhole, here you can sit with your feet in the water and have the little fish eat away at all those nasty bits. we have time to swim and jump of the rocks on the other side. Further along the coast just before the quaint village of Tiwi is Wadi Shab. This is still a very beautiful Wadi but it was devastated when a cyclone called Gonu hit in 2007 and its beauty was not enhanced by the construction of a road bridge across the entrance. It is about an hour’s walk to the Swimming Pools but be sure to have some decent trekking shoes in fact two pairs of shoes are advisable one for trekking and the other for swimming and a bit of rock climbing. Bring some water (particularly in summer) and do not bring any valuables unless you have a waterproof case. The highlight of this trip is to swim and climb over some rocks and to swim through the keyhole. Inside the cave there is a waterfall and the whole cave sparkles with sun light. We advise you not to climb the rope beside the waterfall, a friend of yours once fell off and broke his leg. We first drive south from Muscat past the Muscat Hills Resort and past the Shangrila resort to the beautiful Yiti beach. Yiti in recent times suffered a double blow first it was devastated by Cyclone Gonu and then it suffered as a consequence of economic turmoil in Dubai. A development company from Dubai was going to build a resort here but plans were abandoned when the cash ran out. Yippee!! We can still enjoy the beach!! From Yiti we drive to Wadi Dayqah. A few years ago a very impressive dam was built to provide fresh water for the local community and beyond. Back in 1996 I walked along Wadi Dayqah from the other side of the Hajar Mountains through the devils gap truly awesome!! From Wadi Dayqah we drive through some beautiful date plantations and along a geological wonderland to Wadi Arbayeen!! The large rock pool and the waterfall are magnificent ,It is great fun to jump off the rocks and swim as far as you can against the current of the water fall. After a swim and a picnic lunch we drive back along the wadi and then drive towards the coast to emerge at Bimmah Sink hole which is limestone crater with blue green water at the bottom where we can have another swim if one still has the energy and then back to Muscat. Oneway drive along the west of Muscat to the magnificent Nakhal Fort which is perched on a rocky outcrop of the western Hajar Mountains. The old village of Nakhal leads to the famous hot springs situated at the end of an attractive Oasis. Relax beside the shallow waters of the springs surrounded by lush green date plantations and steep mountain peaks. After spending at Nakhal, we continue our drive through Wadi Bani Auf which brings you to the base of the north face of Jebel Shams, and the beautiful village of Bilad Sayt, hidden between the Mountains.